I started taking riding lessons when I was about 8 years old but I have loved horses as long as I can remember. I rode a lot of naughty horses and ponies growing up, just to get extra time in the saddle. This taught me a lot about patience and I am thankful now because not much of anything scares me and it takes a LOT to get me out of the saddle! 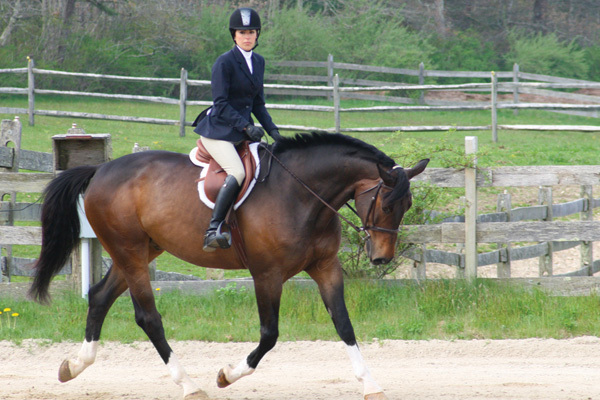 In my adult riding years I’ve owned a little Thoroughbred that I bought off the track, a gentle giant 17.2 hh Argentinean Warmblood, a black Holsteiner stallion, and now my current love – Trent! I bought Trent in 2009. He is one of the sweetest horses I’ve ever met. My trainer jokes that Trent will jump anything if he knew there was a hug on the other side of the jump. Before I got him, Trent had only competed 3 times in the Baby Green Hunters, so last summer we spent a lot of time horse showing to expose him to all the things that go on in the world. My trainer showed him in the Pre-Greens and I started out in the Modified Adult Hunters. Trent and I finished the summer competing in the Adult Hunters, which was our goal, and I was very pleased with his progression both physically and mentally. Slowly but surely, Trent is morphing into an Adult Equitation horse. This winter we’ve been gathering points towards local and regional medal finals, and I’m looking forward to showing more once the warmer weather arrives!. Trent’s SmartPaks include SmartFlex II Support Pellets, SmartDigest Ultra, SmartLytes, SmartB1 and CW. Trent is a young horse with no soundness issues, and I wanted to offer his joints protection as he started his development as a competition horse. I chose SmartFlex II Support Pellets because they have the supportive ingredients he needs, at a reasonable price. Trent has an active show schedule, traveling about 2-3 times per month in the summer. I wanted to make sure his tummy was as comfortable and the rest of his digestive tract was as healthy as possible during the stress of traveling and competing. He also is on a half day turnout rotation and I know that horses that do not have as much access to pasture turnout are prone to ulcers and digestive upset, so I chose SmartDigest Ultra to help him stay healthy. When I bought Trent, he had to take a very long trailer trip to reach his new home. I wanted to make sure he stayed hydrated during the trip, so I put him on SmartLytes to encourage him to drink. After he arrived, I decided to keep him on the supplement to ensure his body was replenished with the electrolytes that were lost during exercise or just during the hot summer months. Now I just consider it his Gatorade! SmartB1 helps Trent concentrate on the task at hand. He is a very quiet and easy going horse, but when things seem out of the ordinary to him, he has trouble focusing. SmartB1 has helped him react less to changes in his surroundings, and he also seems to have more confidence when being introduced to new types of jumps. I chose CW because I want to protect Trent against parasites, especially since we travel a lot for shows, and he is around a lot of horses that we don’t know. I use SmartPaks because it gives me the peace of mind that Trent is receiving the correct doses of his multiple supplements. I think my barn manager would kill me if I brought in 5 buckets of supplements for my one horse! I certainly feel better that I can offer Trent all of the supplements that I think are important for his well being, without putting a burden on the staff that takes such good care of him (and 20 other horses) day in and day out. Also, my barn recycles the SmartPaks so I feel good that the packaging is getting recycled and not taking up space in landfills like many buckets (which are not recyclable) end up doing.